Trying to figure out what you want with what you need can always be a tricky and daunting task. We all want something to feel modern and look amazing, but with the needs of contemporary living we also need practical storage solutions and space saving amenities. That’s exactly why we offer complete concept to completion. We’ve worked with our brands for more than ten years and can offer full advice and support on their products, to figure out what works best for you and your space. In addition to our knowledge we also offer design concepts and a delivery & assembly service, giving you complete piece of mind. 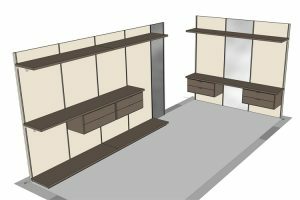 We can help you conceptualize your dream walk in wardrobe. Choose a product that you like and we can create a composition for your space, factoring in your style and storage preferences. There are many different designs to choose from in addition to a multitude of sizes, finishes and internal accessories from across our brands. If the space is not looking quite right we are happy to advise on alternative solutions and also offer ideas for mixing finishes and storage elements, to make the most out of your space. It’s always best to be truthful and we will offer our opinion if we think there may be a more efficient solution available. Our products are built to last and also manufactured to highest quality. It’s always a good idea to think about the future, so we will help you to figure out what finishes will stand the test of time and what your current storage needs may be now and what you may need expanded on in the next few years. 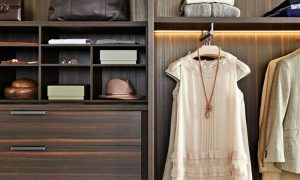 If you have a walk in wardrobe you need fitted, browse through our products to see our collection of designer products and get in touch, to see what we can do to make your dream space a reality.